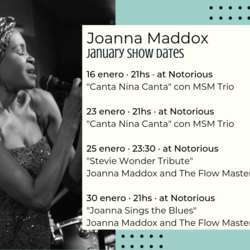 You must be a member of the Buenos Aires Jazz Lovers Group to attend this activity. Would you like to join this group? Joanna Maddox and The Flow Masters return to Protected content to pay homage to the legendary Stevie Wonder. Friday January 25 at 11:30 pm. Reservations are highly recommended Protected content .